All the goodness of a lemon meringue pie in a hand-held bite-sized dessert. These bite-sized pies use packaged pre-baked fillo (phyllo) dough shells as a crust. For a gluten-free dessert, skip the crust all together, and bake pies in small ramekins. Lemon pie filling is a pudding made with egg yolks, sugar, lemon juice and zest. It is thickened by the eggs and cornstarch. Meringue is made from the remaining egg whites, stabilized with sugar and cream of tartar. 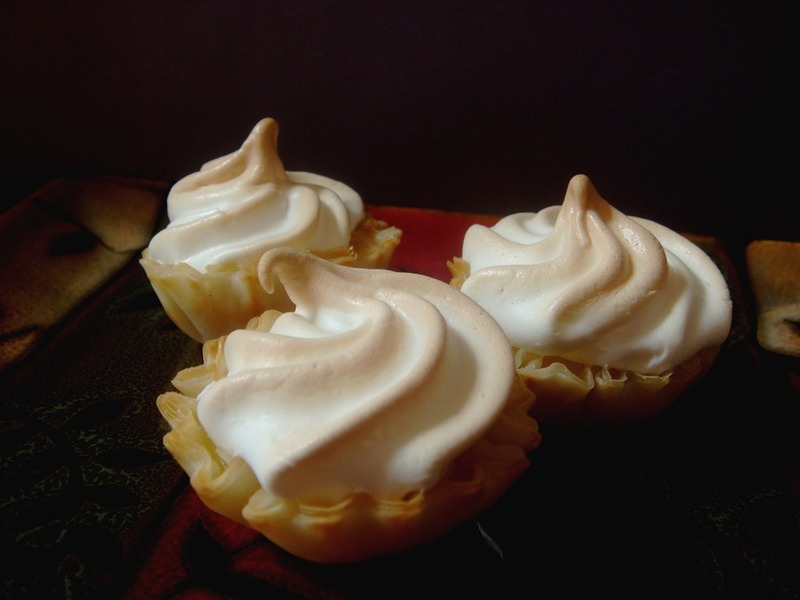 For the mini-pies, I piped the meringue using a large star pastry tip. Because of their small size, it is not as important to seal the meringue completely to the sides of the crust. The pies are baked just long enough to cook and brown the meringue. 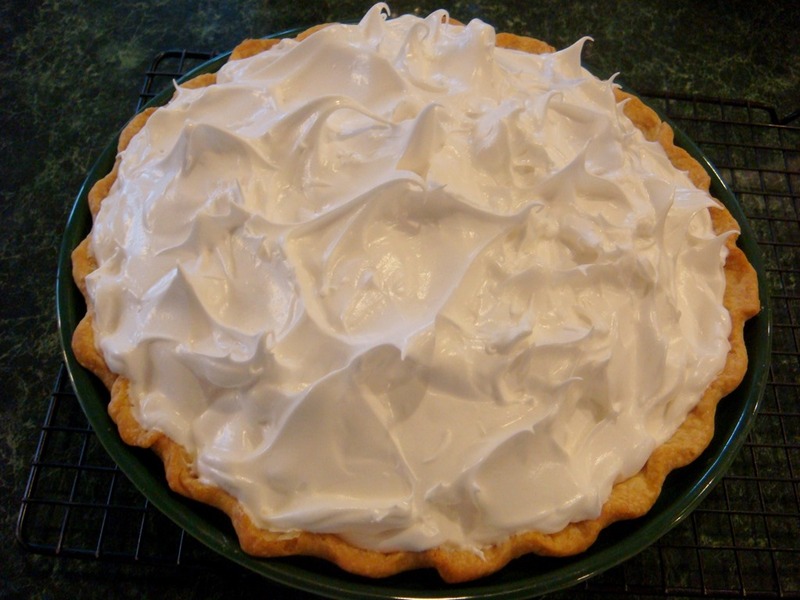 You can, of course, make a regular lemon meringue pie by pouring the hot filling into a regular baked pie crust and spreading the meringue over the hot filling. Bake until meringue is golden brown. 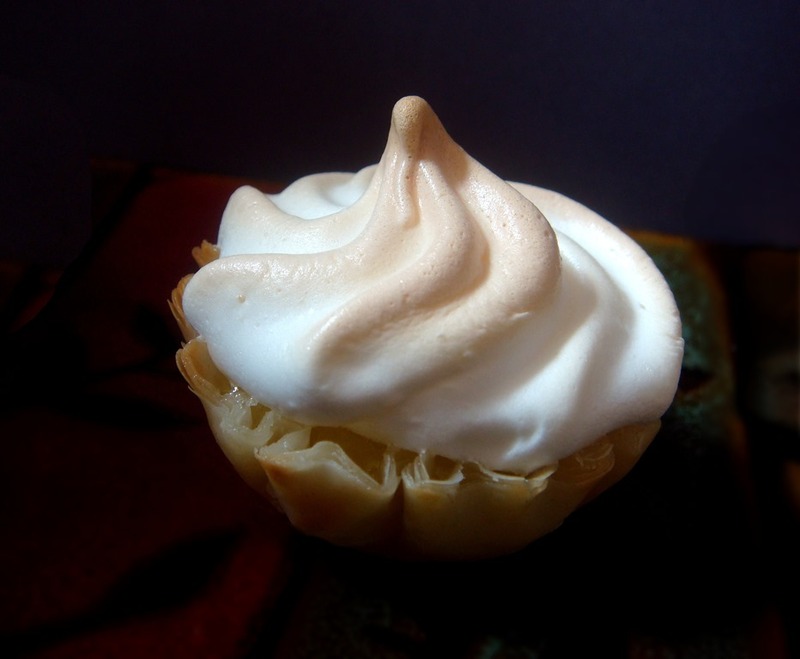 Tips for keeping meringue from shrinking and weeping: Start with room-temperature egg whites for best results. Be sure to seal the meringue to the edge of the piecrust. It should touch everywhere along the edge of the crust. 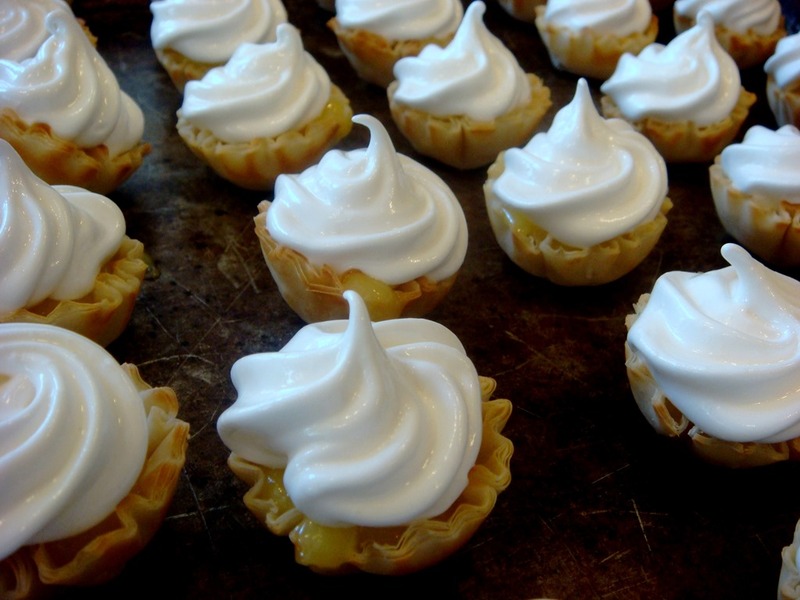 Also be sure that the lemon filling is hot when you spread the meringue over the filling. The hot filling will help cook the bottom of the meringue and keep it from weeping as it cools. The pie should also be completely cool before cutting. Combine 1 ¼ cups sugar, cornstarch and salt in a saucepan. Mix with a whisk. Stir in water and lemon juice until smooth. Separate eggs. Set egg whites aside to use in the meringue. In a separate bowl, beat egg yolks with the whisk until well mixed. Stir into cold liquid in the saucepan. Cook over medium heat, stirring constantly, until thickened and bubbly. Stir in lemon zest and butter. Continue to cook until butter melts. Turn off burner, but keep pan warm. While lemon filling is cooking, prepare meringue: Combine egg whites and cream of tartar in large mixing bowl. Beat with an electric mixer until foamy. Gradually beat in ½ cup + 2 Tbs sugar. Beat until stiff peaks form. Beat in vanilla. Spoon meringue into a pastry bag fit with a large tip. 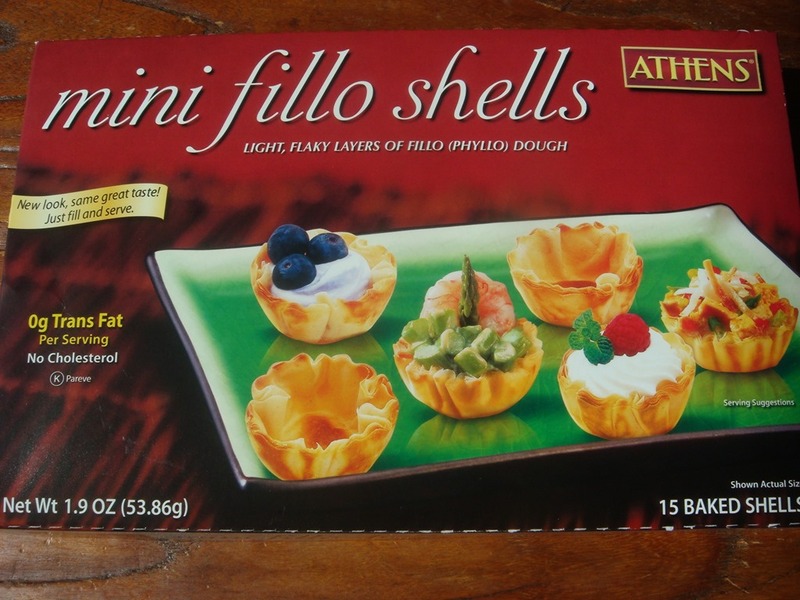 Place fillo shells onto a baking sheet. 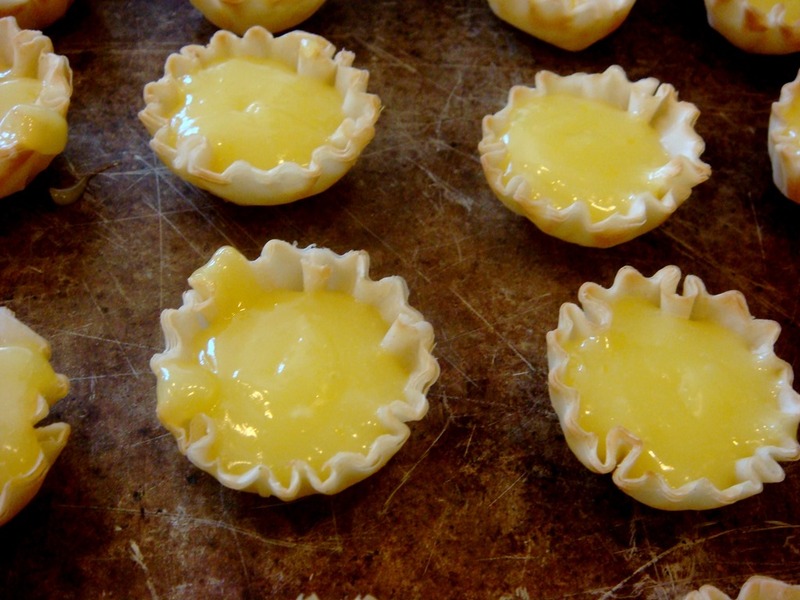 Spoon hot lemon filling into fillo shells. Pipe meringue onto filling. Bake at 350°F for 13-15 minutes. Makes about 45 mini lemon meringue pie bites. For regular Lemon Meringue Pie: Prepare filling and meringue as directed, but do not spoon meringue into a pastry bag. Pour hot lemon filling into a baked pie crust. Spoon meringue over hot filling, spreading to seal to edge of pastry crust. Use the back of a spoon to make peaks. 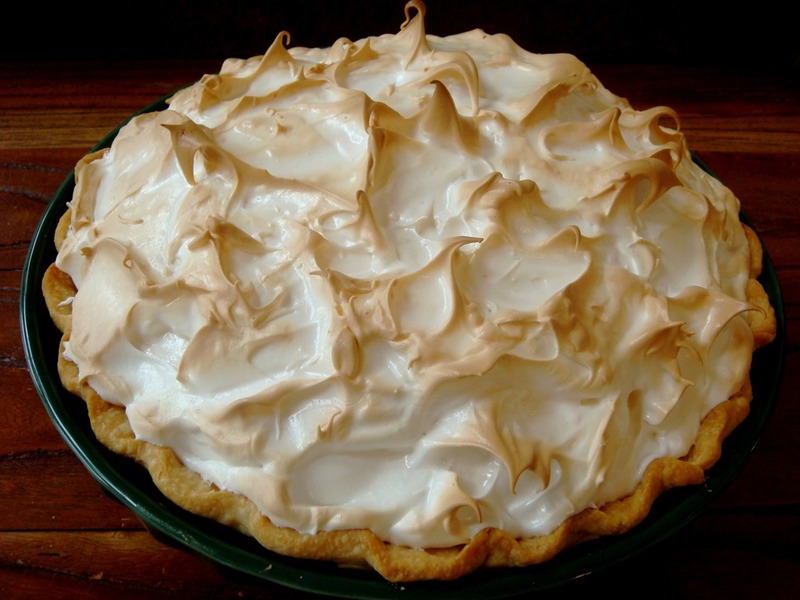 Bake at 350°F for 15-18 minutes, or until meringue is golden brown. Cool completely to room temperature before slicing.